Gourd repairs can be expensive, and they take time. If we are asked to make the repair completely invisible, we will have to follow certain slow and methodical procedures. First we glue and bind the small radiating cracks, and where possible we use inner cleats made from gourd. The separated pieces will be fitted back in a deliberate order, which makes the binding most effective. Piece after piece we load tension back into the gourd, (gluing without binding will deaden the sound). After all the cracks are repaired, we fill with latex filler, and then sand. Filling and sanding will need to be done several times. Next we apply the sealer, 1st coat of stain, then sand, 2nd coat of stain, then sand, then 2nd sealer, and finally 10 or more coats of French polish, with sanding in between. This process is done over three weeks, and then it has to dry for 10 days before shipping. There are 15 to 20 hours of labor involved in the procedure. On rare and expensive sitars and tambouras this is worth doing. It costs between $750.00 and $1,500.00. In many cases, cheaper repairs (Half Finish) are possible. For small cracks and dings we can simply glue, bind, and seal with a few coats of French polish. Our minimum bench fee with French Polishing is $100.00. We do sell new sitars from $500.00, and we can give a parts trade in of $50.00. 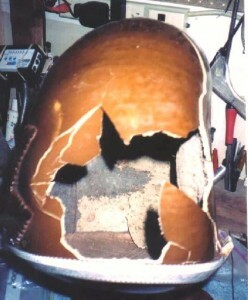 The male tamboura gourd seen below is badly smashed. It is worth repairing because it is a Hemen 6 string concert model, and sells for around $1750.00. 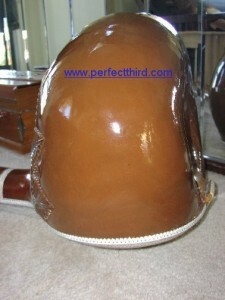 This repair will cost around $1,250.00 in labor (17 – 20 Hours @ $75.00 an hour) To the owner of this Tamboura it is worth it. In a lesser instrument, it would be cheaper to buy another. Some of the gourd is pulverized and will be discarded, other sections are missing altogether. We save what we can of the old gourd, and the rest will be made up from our gourd parts stash. I respectfully offer this warning. There is a lot of very helpful and accurate information on the internet, and there are well-meaning novices who share their personal experiences doing music repairs. Unfortunately the good information sometimes gets buried by the sheer quantity of confusing information. Some of this web advice include instructions about patching gourds with fiberglass, Bondo, carbon fiber, and other high-mass 2-part resins. All these materials have a much higher density and mass than gourd. A patch of fiberglass is like adding a lead weight to the resonator. Heavy patches on gourds work like a bridge damper on a violin. The damper for a violin is a weight attached to the bridge that kills 75% of the sound. (violin students use dampers to practice quietly). Beware of the gourd repair techniques that don’t consider the physics of sound vibration in sitar and tamboura gourds, The affect of adding unbalanced mass to resonating gourds, reduces the higher harmonics, as well as damping the bass growl response, The higher harmonic series form the essential nature of the Jawari sound in sitars and tambouras. In my workshop, we see dead instruments that have been patched with high-mass products. We remove the clumps of Bondo and fiberglass, and rebuild with new gourd pieces. This will restore the instruments lost harmonic resonance. Below you can see – Before and After- Photos.